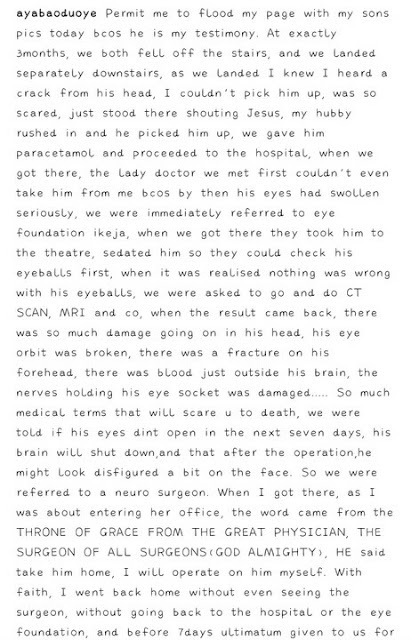 my hubby rushed in and he picked him up, we gave him paracetamol and proceeded to the hospital, when we got there, the lady doctor we met first couldn't even take him from me bcos by then his eyes had swollen seriously, we were immediately referred to eye foundation ikeja, when we got there they took him to the theatre, sedated him so they could check his eyeballs first, when it was realised nothing was wrong with his eyeballs, we were asked to go and do CT SCAN, MRI and co, when the result came back, there was so much damage going on in his head, his eye orbit was broken, there was a fracture on his forehead, there was blood just outside his brain, the nerves holding his eye socket was damaged. "So much medical terms that will scare u to death, we were told if his eyes dint open in the next seven days, his brain will shut down,and that after the operation,he might look disfigured a bit on the face. "So we were referred to a neuro surgeon. When I got there, as I was about entering her office, the word came from the THRONE OF GRACE FROM THE GREAT PHYSICIAN, THE SURGEON OF ALL SURGEONS(GOD ALMIGHTY), HE said take him home, I will operate on him myself. With faith, I went back home without even seeing the surgeon, without going back to the hospital or the eye foundation, and before 7days ultimatum given to us for him to open his eyes, the eyes was healed and u can barely see anything on his face except u take a closer look. All I gave him was just antibiotics. Indeed GOD IS GOOD." 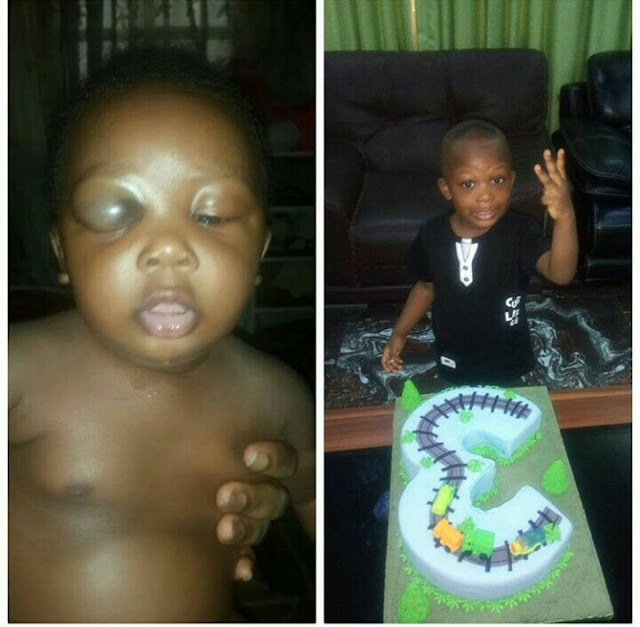 0 Comment to "Actress Mosunmola Fulani reveals how God healed her son who survived from being disable"